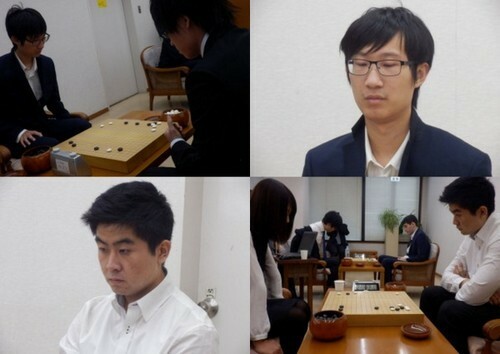 Andy Liu 1p and Gansheng Shi 1p played in an exchange match with Kansai Kiin pros on Friday in Osaka, with Liu (top right) winning his match against Sinntani Yousuki 1p (top left) and Shi (bottom left) losing to Yinaba Karinn 1p (bottom right). Liu, who won two initial rounds of the 12th Sankei Cup pro preliminary, will play a final preliminary round on Monday at 2:30 p.m. Japanese time, or 12:30 a.m. Monday Eastern time (9:30 p.m. Sunday night Pacific time). According to the Kansai Kiin, Ha Yoniru 6p and Arakaki Shiyun 9p will play each other Monday morning and the winner of that match will play Monday afternoon against Liu. The matches will be broadcast on Pandanet; the E-Journal will provide information about the Sankei Cup main tournament when available. See below for game records. 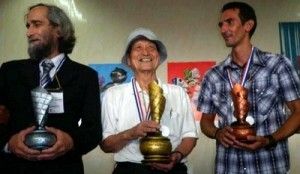 - photos courtesy of Kansai Kiin. The upcoming Samsung Cup semifinal match between Ke Jie and Lee Sedol has the go world buzzing. Ke Jie (right), regarded as the strongest player in China today and currently rated #2 in the world, will face Lee Sedol (left), #3 worldwide, Monday in their best-of-three match. 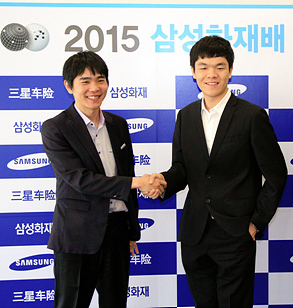 The two players have never before met in tournament play, and the Samsung Cup is one of the most prestigious international titles, with a grand prize of over $250,000 USD. Myungwan Kim 9p will provide live commentary for English-speaking players via the AGA’s official YouTube channel and official Twitch channel. Kim says hundreds of thousands will watch the event in Korea alone, and a large audience is expected in China as well. “These could be the best games of the year,” he says. The games are scheduled for Monday, Nov. 2, Tuesday, Nov. 3, and Wednesday, Nov. 4 (if necessary). Video commentary will begin at 7:30PM PST (10:30p EST) each day. The exchange match between Kansai Kiin young professionals and American and European reps takes place in Osaka, Japan, during the day Friday, late Thursday or the middle of the night Friday US time. 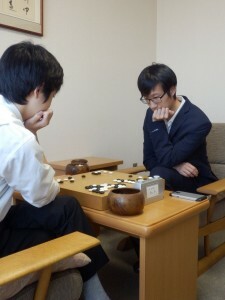 Andy Liu’s (below, right) game will be at 10a Japanese time (9p Thursday East Coast US time), against Sinntani Yousuki 1p. 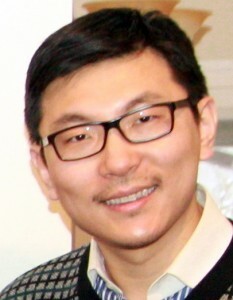 Gansheng Shi (below, center and left) will play at 2p (1a Friday East Coast US time), against Yinaba Karinn 1p. The games should be broadcast on Pandanet. 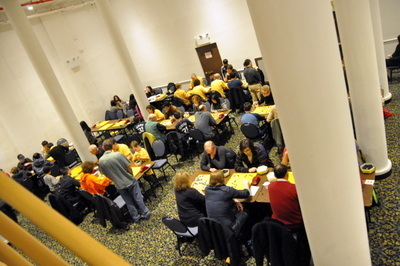 “Considering we were novice organizers and pulled it together in under two months, the Philadelphia Fall Open went smoothly,” reports Benjamin Sauerhaft Coplon, Penn Go Society Treasurer and Chief Tournament Organizer. 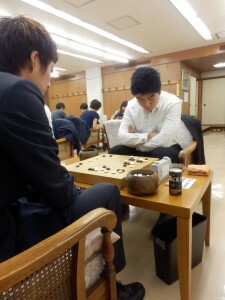 Twelve players participated in the October 25 tournament, ranging from from 6 dan to 17 kyu. “The winners all happened to be new AGA members,” Coplon adds. 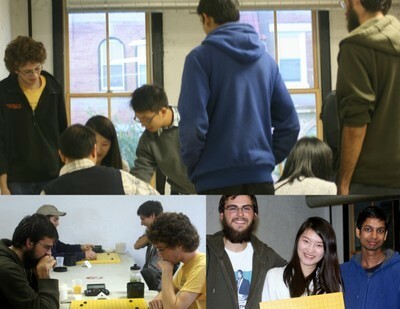 They shared $100 in prizes: First place, Summer (Yuting) Yue, Second place, Amber Jain, Third place, John Deming. Full results available here. “Thank you to all the players for making this event a success, and having patience with our minor difficulties,” says Coplon. “Thank you to Evan Zou for remaining calm under pressure as TD. Thank you to Matt Bengtson, our club president, for providing his expertise and keeping the Penn Go Society running. And finally, thank you to Redcap’s Corner, Gaming Emporium which hosted us for free.” With renewed momentum from the tournament, “The Penn Go Society is looking forward to planning our next tournament within the next few months and expanding the presence of go in the Greater Philadelphia Area,” Coplon said. Life is unpredictable: could be great, could go south. Playing go for nearly three decades has taught me strategies that have benefited me tremendously in my current career in financial planning. Reading out the variations helps me understand which is a manageable trade and which is an unfavorable battle. It’s also important to keep a couple byo-yomi periods for the uncertainties at the end. That said, it’s still impossible to predict a go game or life, but we can always plan to avoid the unnecessary pains, taking only the calculable risks. Why do you play? Tell us in 100 words or less your favorite thing about the game of go, include your name, age, how long you’ve played go, where you live and your home go club, and email to journal@usgo.org. Be sure to include a current photo! 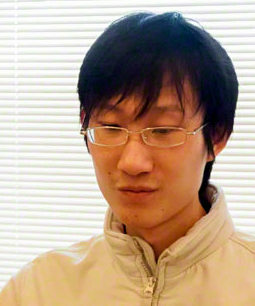 American professional Andy Liu 1p has won his way into the final round of the Kansai Kiin’s 12th Sankei Cup pro preliminary in Osaka, Japan. 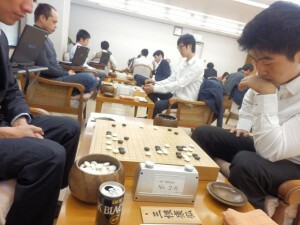 Liu defeated Imayi Kazuhiro 6p by resignation in his first game and won against Takashima Yougo 1p by a half-point in the second round. He plays Ha Yonnyiru 6p on Monday, Nov. 2 at 2:30 p.m. Japanese time. Fellow AGA pro Gansheng Shi lost in the first round to Mine Yasuhiro 3p, and the two EGF pros, Mateusz Surma 1p and Ali Jabarin 1p lost their matches as well. Shi and Liu will also play in an exchange match with young Kansai pros on Friday, Oct. 30, Liu at 10 a.m. Japanese time against Sinntani Yousuki 1p and Shi at 2 p.m. against Yinaba Karinn 1p. All matches will be broadcast on Pandanet. The EJ will update with photos and game records as soon as they are available. Applications are now being accepted for the American Go Foundation(AGF) college scholarship. The program recognizes high school students who have served as important youth organizers and promoters for the go community . To apply, download and complete the application form here. Applicants should describe their accomplishments and volunteer work in a short essay. Letters of recommendation may also be included. Applicants whose enthusiasm and ambition have helped spread go in under-served areas will be given special consideration. Strong players who spend much of their time voluntarily teaching will also be considered, although the award focuses on promoters and organizers who have made substantial contributions during their go career. Applications are due Nov. 14th this year. -Paul Barchilon, E-J Youth Editor.